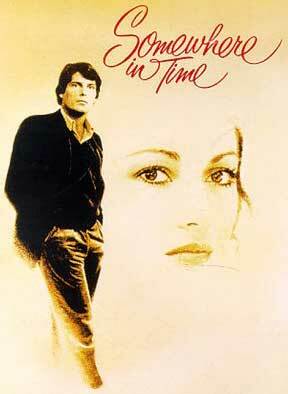 Somewhere In Time (1980), the soupy time-traveling romance starring Christopher Reeve and Jane Seymour, has become a fetishized cult item in the ensuing decades. The story, from a Richard Matheson novel, concerns an unhappy actor, Richard (Reeve), who lands on Michigan's superbly scenic Mackinack Island, stays at the landmark Grand Hotel, and is deliriously smitten by a woman's photo on a wall. It's of a long-deceased actress, Elise (Seymour), and Richard time-travels to 1912 to meet her, to be with her, to stroll with her by the Great Lakes waters. I struggled hard through my second viewing: the acting is too TV-movie bland, and the shooting by director Jeannot Szwarc too pedestrian and humorless for the film to be shlock fun. But don't let me rain on the Somewhere In Time picnic. There are zealous fans out there, and many attend the Mackinack Island weekend each October, to revisit the sites where the movie was shot, and where the transcendant romance happened. 200 strong were in Chicago this summer for a love-in with supporting members of the cast, including Reeve's stand-in. Universal Studios has licensed an official Website: somewhereintime.pair.com, where you can buy collectibles such as a replica of the Elise portrait ($150) or a music box ($80) "with a stunning photo of Richard and Elise framed under a glass lid." Fans send in e-mails, pro and con, whether there should be a sequel. Most say "no" because (a)the movie as is is perfect, and/or (b) it would be in poor taste because of what happened to Reeve.